Only one week left till Christmas and four days until I return home for about ten days. I am really looking forward to going home for Christmas and seeing everyone and more after having far less time at Thanksgiving. The fun continues here in Syracuse; we had a great trip in NYC last weekend seeing the sights and taking in all of the stops in FrancisCorps style! This past weekend here at the house we had our Christmas party and exchanged our secret Santa gifts. Christmas is coming and I can just feel the season starting to really swing into full gear. Even in the midst of all of the these wonderful tidings and joy I the season has called for me something a little deeper. For the past few weeks I have blogged about “letting our guard down” and “stepping back.” Why might I be reintroducing these topics? Well as Advent comes to an end and as Christmas dawns next week, its fair to say, that my Advent journey this year has been very fruitful. As a season Advent invites us to prepare the way for the coming of Christ into the world and is supposed to be a joyful time of anticipation. My experience this Advent season when I let my guard down and stepped back I found Christ in me and through me all the entire time. Continuously I came to observe just how close he was during this Advent season and how His desire rather than my self-desire won out in the end. Often times in today’s culture its often about what me and what I want. Self-desire is not bad and needs to fulfilled. However, I found during this season Advent that what I wanted is not always correct and the need to yield to God’s desire even when I do not understand. 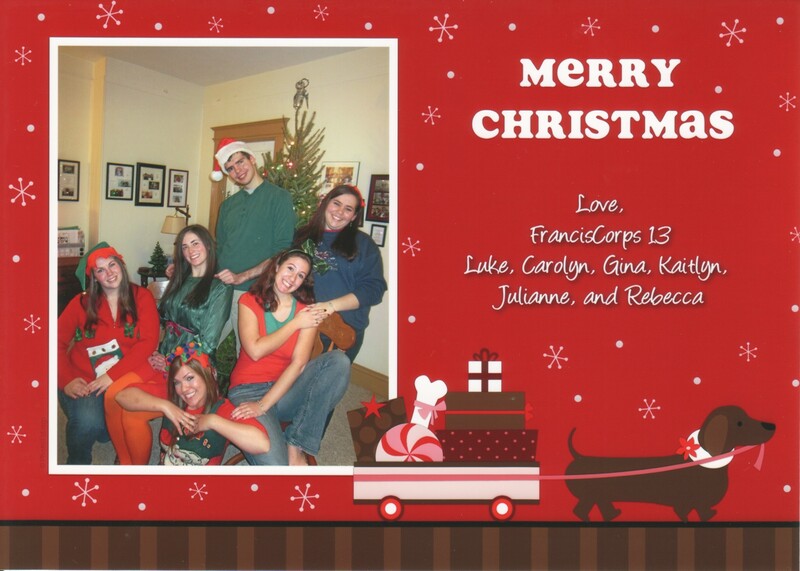 FrancisCorps has been all about yielding to God and putting aside my own needs. In today’s Gospel we witness Mary’s remarkable acceptance of God’s will upon her to be the Mother of God. Mary’s ‘yes’ to God offers us a great opportunity and challenge. The opportunity being we are all called by God to do something great; yet, the challenge is having the courage like Mary to accept or recognize the call. Personally for me, my coming to FrancisCorps is very similar to Mary’s place in the Gospel. God was calling me to do a year of service, but I was fearful of what my happen to me leaving my native Kentucky. In the end, however, I choose to accept God’s will without question and the results have been amazing. Therefore by saying to God, “May it be done to me according to your word,” we can unlock our truest potential as followers of Christ the remainder of this Advent season and beyond. With that I want to thank everyone who has read my blog posts up to this point. I will not blogging for the rest of this year but I wish all of you a Merry Christmas and Happy holidays! Look forward to more blog posts in 2012!